We had arrived at the Mangrove Monkey Tour about 15 minutes early and the boat wouldn’t disembark until there were more passengers. That 15 minutes was put to good use, however. Crazy Alex, as he presented himself, took us around the grounds and introduced us to the resident baby sloth Jackson (“he doesn’t sing and dance”) and explained that mother sloths only care for their babies for six months after birth. He then took us around and identified the myriad of flora on the property, including papaya, cashew and soursop (“I hate it!”) trees. He showed us the futbol field and explained his boss coached/owned a 16-and under team (“It used to be 17-and under but they randomly changed it last month so he had to find an entirely new team.”) He told stories about how hard the team trains, which resulted in them beating one of the top B-league teams and how there is a large, seemingly out of shape player who blew everyone away because he’s the best kicker—and highest scorer—on the team. Before long, we heard a tour bus coming down the dirt road, and our personal tour of the grounds concluded. We stood by as Crazy Alex introduced Jackson (“he doesn’t sing and dance”) to this new group and before long, we were all piling into the covered Panga boat, ready to embark on the 9 a.m. tour. Taking a seat in the front row, I had plenty of room to stow my camera gear and still be comfortable. After a few minutes, another 9-person tour bus arrived and they got on, finally filling us to the 16-person capacity. We were off. As we slowly cruised the pea soup green waters, Crazy Alex pointed out the different kinds of plants that lined the Isla Damas (Ladies’ Island) Estuary. Living in Costa Rica, I’ve seemingly become blind to the huge varieties of colorful plants found here. This boat trip reminded me of the beauty that surrounds you wherever in the country you travel. Every once in a while he called out loudly, “venga!” and explained that the monkeys are very territorial and he always notifies them of our presence. The word translates to “come” and Crazy Alex explained that the monkeys were not bi-lingual. I’m still not sure if he was kidding and people actually thought monkeys learned languages. We saw a ton of reddish-orange crabs crawling in and out of small holes on the muddy banks. There were a couple of different varieties of lizards, including the Jesus Christ Lizard, which can walk (okay, run really quickly) on the surface of the water. Crazy Alex explained that the males of this species are three-times as large as the females, and we only saw one. This lone male seemed to be enjoying his little harem as he chilled out on top of a large tree root while the females scampered around below him. After about 20 minutes, the waterway opened up and we headed over to a distant edge where another boat had parked. Crazy Alex said that his favorite monkey Chiquito must be present. He personally named the monkey two years ago and the name stuck; other tour guides now call this particular monkey by that name. The other boat had left by the time we arrived and it only took one or two more “venga!” calls for at least three white-faced capuchins to approach the boat, fairly aggressively, it seemed. Oftentimes when you think of Capuchin monkeys, the image of cute little monkeys dressed up in outfits or doing funny tricks appears. Seeing these monkeys in their natural habitat reminds you that they are, in fact, wild animals. Crazy Alex identified the most angry-looking monkey as the Alpha. He kept his distance, though he didn’t look too happy we were invading his turf. Crazy Alex identified the first one as Chiquito, but if I’m being honest, they all looked the same to me. Especially when they were showing their large, surprisingly healthy and white teeth, which they did pretty much the entire time. I’m typically not fearful of animals, however I couldn’t help but imagine the nasty bite that would result if one of the monkeys was having an off day. I asked Crazy Alex if they bite (no) and was satisfied with that answer, so I volunteered to be the first victim…errr…volunteer to interact with Chiquito. Much like a circus animal, Chiquito dutifully climbed onto my shoulder then up on my head in order to reach the small piece of banana Crazy Alex was holding out to him. The monkey was surprisingly heavy, maybe about 15 lbs. My husband snapped a couple of pictures, most of them showing Chiquito holding onto a clump of my hair and me looking surprised and slightly concerned. 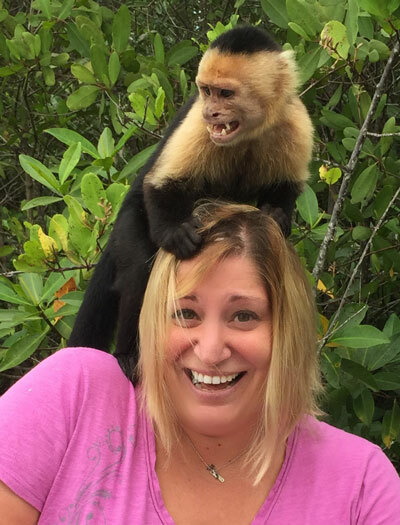 It didn’t hurt; I think it just occurred to me in that moment that I had a monkey pulling my hair. When a Dutch teenager was in the hot seat, Crazy Alex dribbled some water down his shoulder, making everyone think the monkey used the poor kid as a toilet. We all laughed and the teen was impressively calm through it all. Thinking back, I’m not sure he knew what was going on, though. One thing to mention about being in the front seats: the monkeys use you as a spring board. As monkeys do, they were constantly climbing and swinging around the boat. They always returned to the front, though, which meant that either my husband or myself were constantly being utilized as jumping off points. This made for some great selfie opportunities, I have to say! I also got some great candid shots with my DSLR, a few of which are included here. As a side note, I highly recommend sitting in the front row if you’re a nature photographer, as there’s the added benefit of not having strangers’ heads in your shots. I was a little sad when it came time to bid adios to our monkey friends. Crazy Alex had delivered on his promise of showing us a good time, and I was bummed when the tour ended. A huge thank you to Crazy Alex, Chiquito and the rest of the Mangrove Monkey Tour team! If you are bald or have thinning hair, wear a hat! Bring a camera that can take pics in quick succession…these little guys move around quickly! Try to sit in the front row! Here’s a short video of one of the boat passengers enjoying the tour.